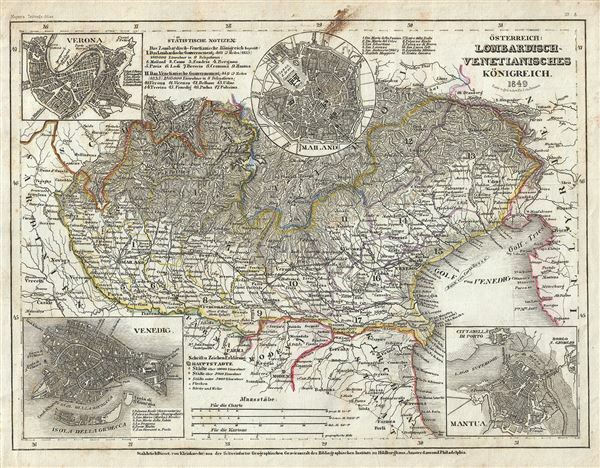 This is a fine 1849 map by Joseph Meyer depicting the Kingdom of Lombardy-Venetia. It covers the north Italian territories of Lombardy and Venetia, merged together and ruled by the House of Habsburg-Lorraine, from Lake Maggiore to the Gulf of Trieste and from Lienz south as far as Modena. Four insets detailing the cities of Mantua, Venice (Venedig), Verona and Milan (Mailand) are included. Throughout the map identifies various cities, towns, rivers and an assortment of additional topographical details. Following the merging of the territories by the Congress of Vienna in 1815, the region witness a revolt against the Austrians during the First Italian War of Independence in 1848. The Austrians won and retained controlled of the Kingdom of Lombardy-Venetia until 1859, when following the Second Italian War of Independence and the Treaty of Zurich, the territory of Lombardy was annexed to Italy. The Province of Venetia would remain under Austrian control until the Austro-Prussian War or the Third Italian War of Independence in 1866, when it would be ceded to the Kingdom of Italy. This map was issued as plate no. 8 in Meyer's Zeitung Atlas. Although all the maps in this atlas are not individually dated, the title page and maps were often updated while the imprint with the date was not, causing confusion to the exact date for some of the maps. Moreover some maps in the atlas were taped in at a later date as an update to the atlas. We have dated the maps in this collection to the best of our ability. Very good. Minor toning and spotting at places. Some foxing near top border and over right margin.